The Nigerian Army has arrested 10 herdsmen for destroying farmland in some villages in Benue State. Troops participating in Operation Cat Race arrested the herdsmen on Monday while on routine patrol in Tse-Tigir and Tse-Ndugh villages, a statement by the Director of Army Public Relations, Brigadier-General Texas Chukwu, said. “While in the act of destroying the farmland, the herdsmen sighted the aggressive troops and fled into the Bush. The determined troops pursued and arrested them,” the statement read in part. 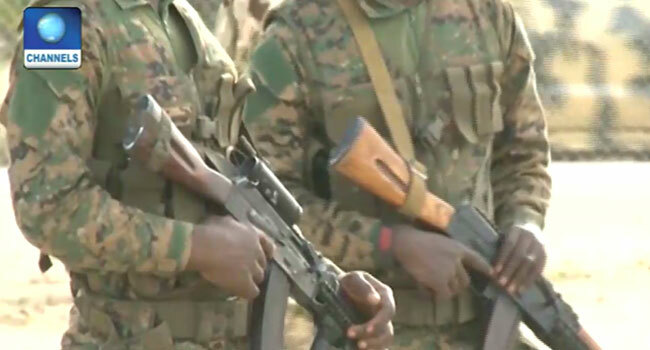 The troops – of Sector 1 (Sub-Sector A) deployed in Yelwata – recovered five motorcycles, two machetes, some assorted charms and the sum of N120,000 from the herdsmen. After their arrest, they were handed over to the Nigerian Police for further action. The army restated its commitment to fishing out criminals and to protect farmland in the state and called on the public to support its efforts. Operation Cat Race, the military exercise aimed at curbing conflicts and other criminal activities in the north-central was inaugurated in Makurdi, the Benue State capital on Tuesday, last week by the Chief of Army Staff, Lieutenant-General Tukur Buratai. The military intervention came weeks after several attacks by the herdsmen that have since sent many of the state indigenes to their early graves, most notably on New Year’s Day. During the inauguration, Buratai had warned the troops to engage any group of armed herdsmen terrorising local communities or face a military court-martial. The army had earlier announced that the operation would run from February 15 to March 31 in Benue, Taraba, Kogi, Nasarawa, Kaduna and Niger states. It is expected that this would bring under control, to a large extent, the issues of farmers and herdsmen crisis and other ancillary security challenges in that zone.